Recently I concluded a guys only Support Group at a local high school which, at the time, I thought was pretty successful. I had built some strong relationships with those young men, found common ground, and seemed to gain their trust. A measure of success for me with teenagers is their willingness to talk about the real stuff – and these guys had no problem telling the truth, even to the point of being uncomfortable. Fast forward a few weeks. I walked into another group which is at a local drug rehab for adolescent boys. One of the guys from my previous group was there. He had broken his probation for drug use and was mandated a treatment program. I had also found out two other boys from my previous group got caught up in some heavy drugs and kicked off their school campus. So, what I thought was a successful guys group turned out, at least on its surface, to be a bust. If you work with teenagers very long, you will face some disappointment. Really, it’s part of signing up. But, it isn’t why we get into it. I got into working with teenagers because I felt like they were a lot of fun to hang out with, I could relate, and maybe I could contribute to their growth in some way. That’s why most people get into a helping profession involving kids. We just love being around them. But we aren’t always motivated by what it really takes to be successful with teenagers – the long haul. This is especially true in cases involving teenagers in crisis, that is, students who have significant risk factors at play in their family and development. Part of leading a group with those guys helped me understand more about their background. They all had at least one parent who had either rejected them or was no longer in the picture because of prison or by choice. Their systems failed. People failed. Bad choices were made. Labels were applied. They were now “bad kids”. Then, one by one, the adults surrounding these guys gave up on them. These boys in return gave up on the adults around them. Everyone just gave up. And, after working with these guys for a long time and watching them just fall back into drugs and bad choices, made it tempting for me to give up on them too. They knew what I hoped for them. They remember our conversations. It was really discouraging to see their choices and what path they traveled. But here is the thing. At the drug rehab, my young friend lit up when he saw me. I was a familiar face in a difficult situation. We got to talk, and he expressed to me his desire to get things together. My other two friends connected with me as well, and we were able to process the consequences they were about to endure and what they could do differently in the future. I chose not to give up on them. And, that is a choice I will likely have to make a few more times before the story is complete. Why am I writing this? Don’t give up. That’s what I’m saying. 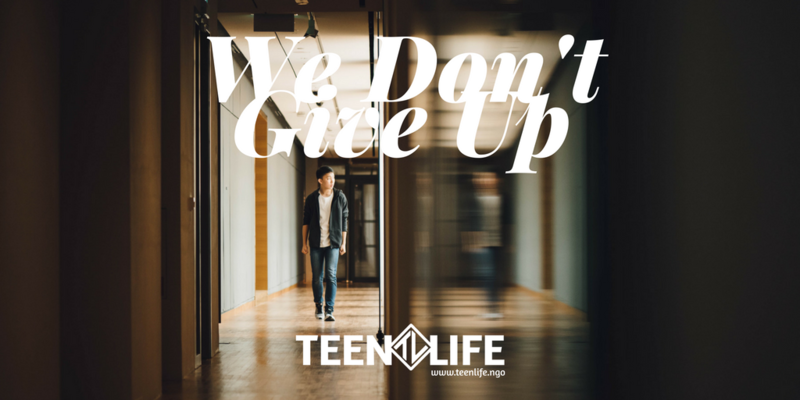 For those of us who work with teenagers – we don’t give up. It isn’t an option. So many others will give up. You don’t have to. If you are an adult in a relationship with a teenager who is disappointing you – don’t give up. Keep your eyes on the future. Process mistakes and set different goals.